If you write anything longer than a paragraph, then Gabe Weatherhead’s new Bookmarker Macros for Editorial are going to get you pretty excited. They let you highlight any section of a text document and save it as a bookmark. 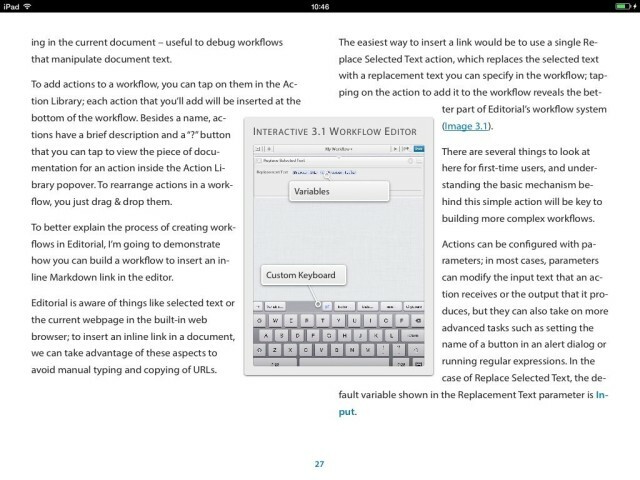 Remember Federico Viticci’s review of the amazing new iPad “text editor” Editorial? 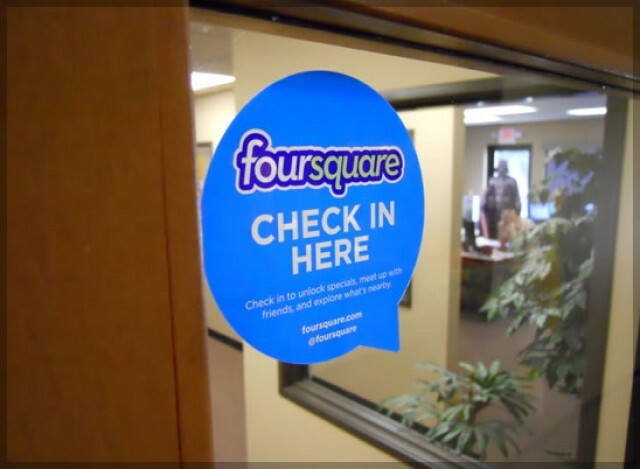 Of course you do – it’s the one you pushed to your read-later service and never read later, because it was just too damn long for a single post on a website. Hell, the thing even had a table of contents. A blog post with a table of contents. Now, though, you can enjoy Viticci’s opus in a form much better suited to a long text with multiple sections: a book. And being an Apple nerd, Viticci made it into an iBook. Brett Terpstra’s SearchLink is a System Service for OS X which automatically generates links from your text, without you having to bother to look anything up on Google first. It’s like having an unpaid intern inside your Mac. 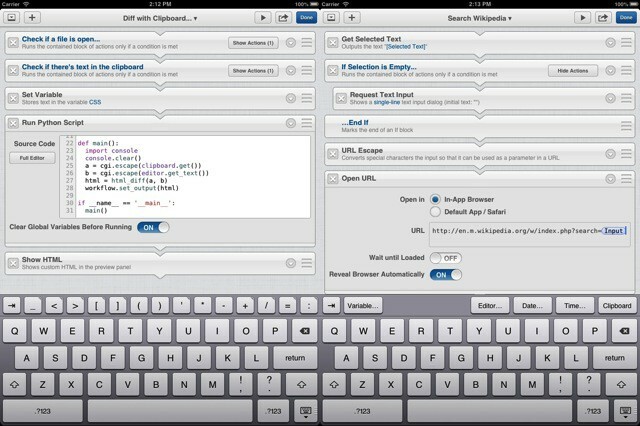 And Editorial is that fancy new iPad text editor that incorporates workflows that you can roll yourself. Now the two have been combined into one amazing iPad ball of goodness. Editorial might just make you ditch your computer altogether as a writing machine. It’s a new iPad text editor from Ole Zorn, the man behind the incredible Pythonista app (Editorial actually features a built-in Python editor). 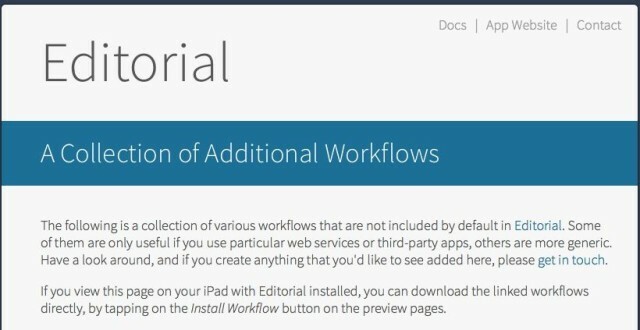 Editorial could just be used as a really polished, really well-designed text editor, but it also has customizable, Automator-style workflows that let you do pretty much anything with the text you have in the app. Ole Zorn, the super-villain behind the amazing Pythonista for iOS, has just started teasing his newest app – a Markdown text editor for the iPad. Only unlike all the other Markdown editors, this one is looks like it’s as programmable as Pythonista. I’m getting pretty excited. 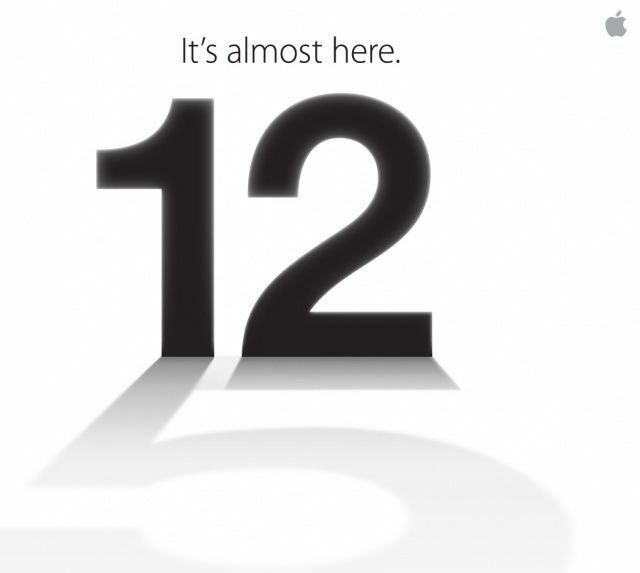 Apple's invite for today's event confirms the next iPhone will be called the iPhone 5. We thought we’d had it all figured out. When Apple bucked the trend of numerically naming the iPad by calling the Retina iPad the “new iPad” instead of the iPad 3, we thought it was a sure thing that they’d do the same thing for the next iPhone. The next iPhone, then, would be “the new iPhone” or the “2012 iPhone”, not the iPhone 5. It made total sense, in a way: Apple doesn’t add a numeral to the end of its other products, like the MacBook Pro or the iPod Classic. They don’t even do it for the iPod touch, which is basically the most current iPod with all the phone guts stripped out. Why continue setting apart the iPhone as a sequel to the handsets that have come before when you can position it, not as an incremental update, but a timeless product in its own right: the Mercedes of smartphones? That’s the way Apple handles the rest of its products, but with the invitation for today’s, and now Apple accidentally spilling the official name of the next iPhone on their website, it now seems clear that Apple is going to call the sixth-generation iPhone the ‘iPhone 5’ after all. Why would they do that? 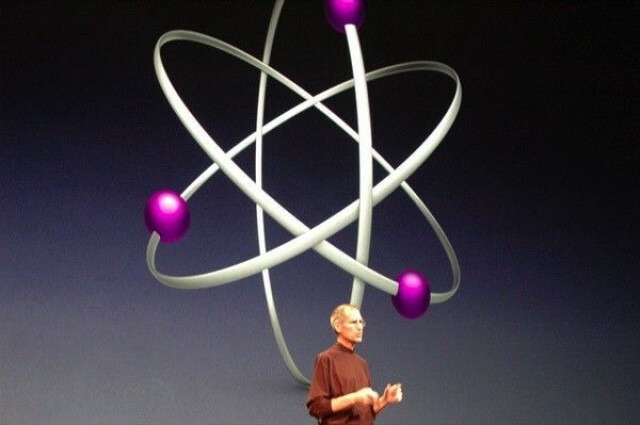 Steve Jobs introduced Genius back in 2008. It could be the brains behind Apple's rumored streaming music service. The big story of yesterday evening was a somewhat cryptic report by The Wall Street Journal that Apple wants to build its own streaming music service, a la Pandora. Once you step back from the “hey, wouldn’t that be cool”-edness of it all, it’s a weird report. But it may not be totally bonkers. In fact, it probably makes a lot of sense. Today’s Education Event at the Guggenheim in New York City was by all reports supposed to be “demure,” but that didn’t stop Apple from making a big splash. In fact, today’s event may have marked the most concerted attempt by Apple to revolutionize the classroom since the original Apple IIe. Among today’s announcements? A new version of iBooks that makes textbooks on an iPad fully interactive, along with free authoring tools so easy-to-use and revolutionary that literally any author can create a beautifully formatted interactive e-book. Coupled with iTunes U — perhaps the most comprehensive classroom learning software ever — and a pledge to keep the price of all textbooks at $14.99, Apple’s goals are clear: they want to get an iPad in the hands of every student in the country. 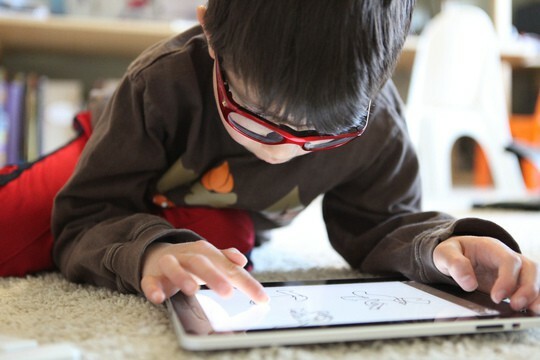 There’s only one problem, right now: the lack of a budget iPad. It’s a problem Apple can (and should) fix. We’re only about two or three months away from the iPad 3 dropping and blowing our socks off. Right now, we can tell you a lot about what the iPad 3 will probably be like. It’ll feature Apple’s new, quad-core A6 CPU. It’ll feature a 2048 x 1536 resolution Retina Display. It may — but probably won’t — be the first iOS device to ship with LTE support. But what about Siri, Apple’s amazing new voice control technology prominently featured in the iPhone 4S? Surely, that’s a lock for all future Apple devices starting with the iPad 3, right? Well, hold on. Don’t count your chickens before they hatch.